Discovered in Dust from the 9/11 World Trade Center Catastrophe" in Sacramento, California. In this video, Steven calls for a CRIMINAL INVESTIGATION of the demolition of the World Trade Center Towers. He calls for the National Institute of Standards and Technology (NIST) to LOOK in their sample of the dust and see if they find nanothermite. This is something they have not done for 8 long years! Steven reviews recent developments wherein government laboratories have been covering the tracks of their military partners. Lawrence Livermore National Laboratory (LLNL) has prevented BBC television from publicly showing critical nanothermite physical evidence. NIST uses unphysical computer models instead of physical evidence and has an embarrassing inability to look for the obvious. And remember, NIST’s computer program is irrelevant, since the PHYSICAL model did not collapse. NIST hired Underwriters Laboratory (UL) to built in built and test this model in 2004. When subjected to twice the fuel, twice the oxygen, and twice the physical load, the physical model did not collapse. The floor beams did sag 4 inches. Compare this to NIST’s unphysical computer model which they had to tweek to 44 inches before “collapse ensues”! That’s ten times from reality! And by the way, that factor of ten is far beyond the known safety factor always designed into the buildings! Kevin Ryan, one of the authors of "Active Thermitic Material Discovered in Dust from the 9/11 World Trade Center Catastrophe" and a former employ of UL was fired for criticizing his company’s client, NIST. This is our own government’s national laboratories! Who are they trying to protect? Why are we still paying these guys to lie? How do they sleep at night, knowing what they have done? Maybe they say, “Oh, I just invented it, somebody else used it.” Where have we heard that before? After the talk, Steven held a lively and interesting Question & Answer session with the obviously spell-bound audience. Niels Harrit, first author of the paper, said: “Our work should lead to demands for a proper criminal investigation of the 9/11 terrorist attack. Because it never happened. We are still waiting for it. We hope our results will be used as technical evidenced when that day comes.” He said this on TV2NEWS in Denmark on April 6, 2009, three days after their nanothermite paper was published. This interview, with subtitles, is included as a 10 minute bonus track on the DVD. This video clip is remarkable for its candor and the openness of Danish TV. Niels’ presentation is stellar and he left no doubt in the viewers mind that there are a lot of people who agree with him! Steve Jones from 2006 and Richard Gage from 2008 each appear in very pithy 10 minute condensations of their longer lectures. These clips are great as a foot-in-the-door for hesitant viewers and those that can only take a short time to view. NANOTHERMITE is the proof of government terrorism in America. Please copy and distribute this video far and wide. Permission is GRANTED for public access use of this video. The one-hour video, as well as the 1/2 hour Q&A are edited to public access length with production slates already included, ready to go. Just take this disc or a copy to your local public access station and make arrangements to show these videos on your local public access station. This is the BEST way to get the video evidence to the MOST people, and we hope many of you will be inspired to get this evidence on your local public access station. We have a huge archive of 9/11 public access material and can keep you in video for many years. 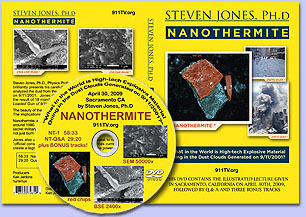 911TV will send, free of charge a boxed copy of NANOTHERMITE to any library in America that requests it. Your job is to go to the library and get them to request it. Just have your librarian send an request with subject line “free copy of NANOTHERMITE”, including their return mailing address, to 911TV1@gmail.com.